Be the first to share your favorite memory, photo or story of Winston. This memorial page is dedicated for family, friends and future generations to celebrate the life of their loved one. It is with regret and profound sadness that the family announces the passing of Winston J Wilson, former Police Lieutenant and Training Director (St. Thomas). Mr. Wilson died on January 11, 2019 at the VA Hospital in Puerto Rico. Grandchildren: Deianara Wilson, Kinola Smith, Jaylen Smith and Justin Smith. Relatives and friends are respectfully invited to attend the first viewing on Friday, February 1, 2019 at the Alexander A. Farrelly Justice Center /Complex from 5pm – 7pm. The second viewing will be held on Saturday February 2, 2019, 10 a.m. – 11 a.m.at the Bovoni Baptist Church. The service will follow immediately at 11:00am. The family would like to express heartfelt thanks to Dr.Sasha Mercano and the wonderful staff at the VA Hospital in Puerto Rico and the local VA family. Special thanks and appreciation to First Sgt. Bernard Burke, CPL Michelle Potter, and the caring caregivers. In lieu of flowers, please make donations to the Eldra Schulterbrandt Living Center; 4185 Annas Retreat, St. Thomas VI 00802. To plant a tree in memory of Winston James Wilson, please visit our Tribute Store. 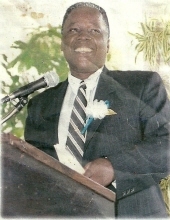 "Email Address" would like to share the life celebration of Winston James Wilson. Click on the "link" to go to share a favorite memory or leave a condolence message for the family.